In the two-week period before the half-term break students from Years 5 to 9 were invited to complete an online Maths challenge hosted by the Seoul Foreign School. Challenges were set at three different levels – Bronze, Silver and Gold, and at the lower levels multiple attempts were allowed. As you would expect, the questions were … challenging! They took some figuring out and, as so often happens, multiple lines of attack may have been needed before the “A-ha!” moment of recognition. “John”, “Brandon”, “John”, “Brandon”, “Sam”, “Brandon”. What is his real name? And Ryan successfully completed the Gold Challenge as well! In addition to the individual challenges, there was also a group challenge for which students had to produce a mathematical video. Our Year 9 students produced a very nice short movie showing simple statistical measures, and this may well form the basis of a video challenge of our own later in the year. Year 5 and 6 also worked on this group challenge. 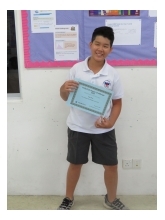 Four groups submitted excellent videos but only one could be chosen, and this was the one made by Pik Yen, Anny and Sunny from Year 6. They did an excellent job of showing Maths in everyday life. Well done to these students, and well done to all the students who took part.